Over Across is the largest of the four cottages and has an unusual split-level design. 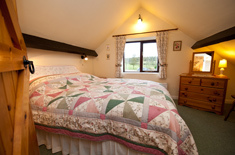 The three bedrooms sleep seven – four adults and three children. 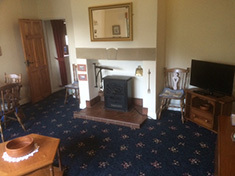 Two bedrooms are upstairs –a double (with extra single bed or cot available on request) and a twin room that has one full-size bed and one child’s cabin bed, 5’6” in length. 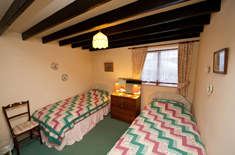 Downstairs is a twin bedroom next to the bathroom and kitchen. The large lounge-dining room with high-pitched ceiling faces west, French windows lead onto the private patio with panoramic views over Harwood Dale and the moors beyond. 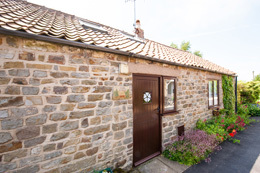 This cottage is ideal for larger families, the three-generation family or two families who like to holiday together. A cot & high chair are available at no extra cost.